Does Adding Sand Always Mean A Better Beach? Beach nourishment, the process of dredging up sand from the seafloor to replenish eroding beaches and protect coastal ecosystems, has a history that goes back to the 1920s expansion and widening of the beach at Coney Island. But does it work as intended? And where does all that sand go once it’s placed? 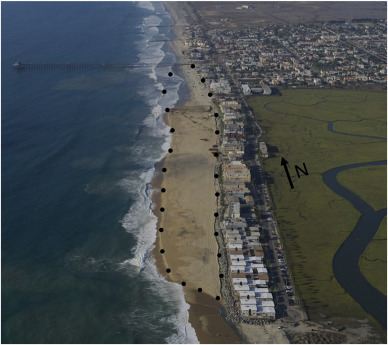 Research in the journal Coastal Engineering looks at the effects of nourishment on four beaches in California. Study author Bonnie Ludka, a postdoctoral fellow at the Scripps Oceanographic Institution at the University of California, San Diego, explains the pros, the cons, and the not-yet-knowns. Bonnie Ludka is a Postdoctoral Scholar in the Scripps Institute of Oceanography at the University of San Diego in San Diego, California. Because every story has a flip side. Now, beach sand, you go to the beach, you know, it comes and it goes. It’s literally washed away by tides and wind, sometimes faster than the waves can pile it back up. So it is common for coastal engineers to try to replace the lost sand with sand scraped from offshore or elsewhere where the sand gets deposited. It’s a process called nourishment, but does it work? The study appearing in the journal Coastal Engineering asked this very question looking at four beaches in California. And while the researchers found that beach nourishment has helped keep some California beaches sand-filled, in the face of some challenging times, there are some downsides, too. Bonnie Ludka is a post-doctoral fellow at the Scripps Oceanographic Institute at UC San Diego. Welcome to Science Friday. BONNIE LUDKA: Hi, it’s great to be here. Thanks for having me. IRA FLATOW: You’re welcome. So what are we learning for sure about the benefits of adding sand to beaches? BONNIE LUDKA: Yeah, well, the story just changes depending on what nourishment you’re looking at. But the few that we studied here in Southern California, there were some that were built with larger than native sand grains. And those maintained relatively wide beaches for many years, even during a big wave El Niño winter. So they helped protect the back beach from erosion and flooding from wave-overtopping and promoted tourism. IRA FLATOW: So it really depends. The size of the sand grain was crucial. BONNIE LUDKA: Yes, we compared that behavior to a nourishment that was built with sand with native grain sizes which washed offshore in one moderate storm months after it was placed. BONNIE LUDKA: That said, that sand was stored in a large offshore bar, and some of it returned to the upper beach the following summer. But if you’re trying to make the beach wider, then the coarser grains were more successful in some sense. IRA FLATOW: When we are talking about nourishing– I love that phrase, nourishing the beach. IRA FLATOW: I have never heard of it. Back in the days, we used to just call it an erosion and filling it back up. But we didn’t have hydrating back then either. How much sand does it take to fill a beach up? BONNIE LUDKA: Well, that’s one of the big questions. We want to know if we want to keep these beach beaches wide, how much then do we need to add? How often? And if we do that, where does the sand go? IRA FLATOW: OK, so the good news is that if you choose your sand right, you can get the sand back on the beach. So what’s the bad news about this? BONNIE LUDKA: All right, well, some of those coarse-grained nourishments that we observed also caused some controversy. At one site, groundwater flooding occurred at low-lying homes that were adjacent to one of the coarse-grained beach nourishments. And at the same site, nourishment sand migrated kilometers along shore and contributed to clogging a river mouth, causing hypoxia in the estuary. IRA FLATOW: Wow, that’s not good. BONNIE LUDKA: Yeah, hypoxia is a loss of oxygen in the water that can cause die-offs of fish and other aquatic species. And in this case, there is a bunch of dead Leopard sharks. So caused some controversy there. And other studies have shown nourishments might have a negative impact on intertidal invertebrates that serve as prey for shorebirds and fish. So oftentimes, nourishment constructed with sand that’s similar to the native sand are preferred to help mitigate the damages to the natural ecosystem. IRA FLATOW: Now, I’ve seen headlines before that we’re basically losing our beaches to climate change. Is this what’s happening? Are we going to need to nourish beaches more in the future? BONNIE LUDKA: Ah, that’s possible. As seas rise, beaches will have to move landward with the waterline. However, we aren’t sure which beaches will be inherently capable of that migration, and furthermore, existing infrastructure could block the migration of the beach depending on how coastlines are managed. So nourishments are one way of attempting to maintain beaches in the face of sea level rise. IRA FLATOW: So tell us what you need to study or what we better need to understand about this whole practice. BONNIE LUDKA: Yeah, nourishments are still really understudied in terms of the sand evolution, their ability to mitigate flooding and erosion under varying wave conditions, and their influence on water tables and ecosystems. So we believe that as these projects are implemented, it only makes sense to monitor them and to try and learn as we go, with the hope that we can provide information to help coastal communities better prepare for their future. IRA FLATOW: Well, Dr. Ludka, thank you for taking time to be with us today. BONNIE LUDKA: Thanks so much for having me. IRA FLATOW: Bonnie Ludka, post-doctoral fellow at the Scripps Oceanographic institute at UC San Diego. A lofty view from space reveals the Red Planet's polygonal geometry.